Join Priscilla Shirer, Beth Moore, and Kay Arthur for two weeks of daily Bible study. Anointed Transformed Redeemed: A Study of David. At Deeper Still: The Event, three women explored their lives and the life of David. You’ll laugh with them, cry with them, and learn to love God with them. 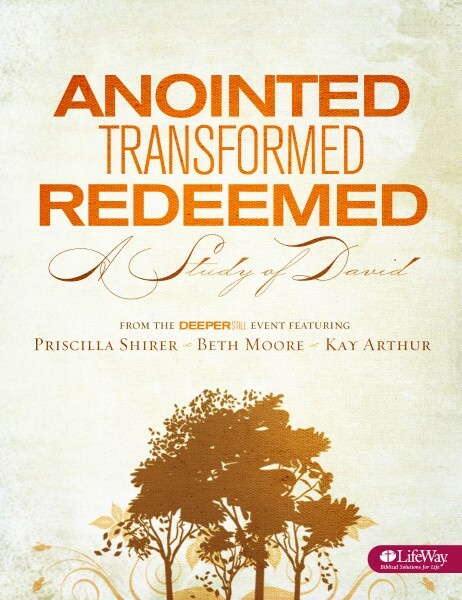 Join Priscilla Shirer, Beth Moore, and Kay Arthur for six weeks of daily Bible study by each author. This workbook provides six weeks of interactive, in-depth Bible study and group leader help. Each segment focuses on David at a different stage of his life: as young man (by Priscilla), as a middle-aged man (by Beth), and as a man facing the final third of his life (by Kay).